Today's ride was sponsored in part by The Old Bag, and by John in Maine. Thanks, guys, for keeping me on my toe clips ... so far. Long way to go, still. The ride went shorter than planned today when Geoff and I headed down to the Anchor River to look for a winter trail, which was displayed with some prominence on our map. It was eight bone-chilling downhill miles to the Anchor, only to arrive to a half-frozen river and no sign of a trail. Even the moose we saw near the bridge was breaking his own path through the snow. My guess is the river itself is the winter trail. But because temperatures haven't been any higher than a degree or two above freezing since people had pumpkins on their porches, I have to wonder when exactly this winter trail forms. 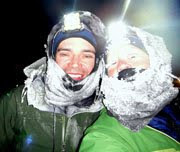 After that, we had only the long climb home, plodding slowly through gritty snow on the Sterling Highway shoulder with a lot of time to think about all of the gear we need to acquire. I'm pretty well equipped - with the exception of footgear, which I am especially lacking (I snowshoe in the same pair of trail-running shoes that I hiked the Grand Canyon in). At 8 degrees, today was an eight-sock day. I do think it's time to plunk down a few bucks for neoprene booties. Lemme get this right, you ride up in Alaska without neoprene booties? Hi! Just dropped by to say thanks for visiting! "Hello, I came to your site from Fatty's. I enjoyed the story. My original reason for coming over was because I wanted to say that you should try riding your bike in the snow. You might enjoy it." Second, I was just bustin' Fatty's cajones. 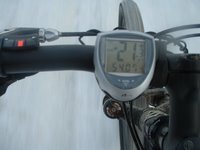 I HAVE ridden in the snow. Not like you are apparently doing, tho. Actually I rode my motorcycle through a blizzard once. A foot of snow on the ground, and still coming down in huge crocodile flakes. 15 miles down a snaky mountain road. It was a moderately thrilling ride. Anyhoo, this is a GREAT looking blog! I've 'booked' you and will be back to follow your adventure. I'm gonna keep tunin' in. Thanks for stopping by my blog... Mall Santas are definitely creepy! I'll be visiting your blog again soon. so after seeing that you live in Homer Alaska, I just HAVE to ask if there really is a place called Alice's Champagne Palace and if you've ever been there. My all time favorite singer, Ellis Paul, has a song called Alice's Champagne Palace and I have always wanted to go to Homer to see it. 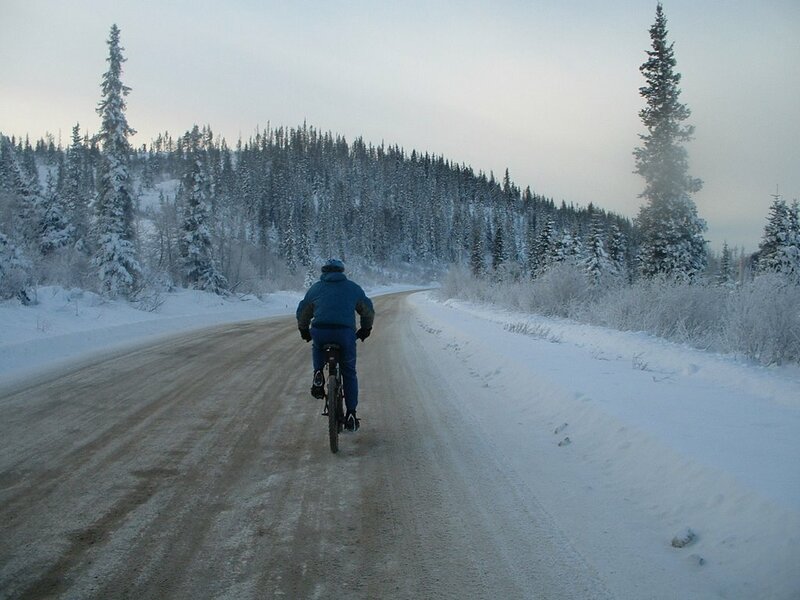 Back before the turn of the century people traveled by bike up & down the Yukon River all the time in the winter. Virtual Cycling - Tacx have a great product called the Tacx Fortius, it is basically a turbo trainer connected to a PC so you can ride or race in a virtual environment.